The core steps are – 1. lay in the colours, 2. block in the rough light and shade, 3. add in the detailed shadows and highlights. Note – I’m referring to Photoshop in this tutorial, but it’s exactly the same in Gimp. I’m very partial to parchment backgrounds, but stone, cloth or other backgrounds also work well. 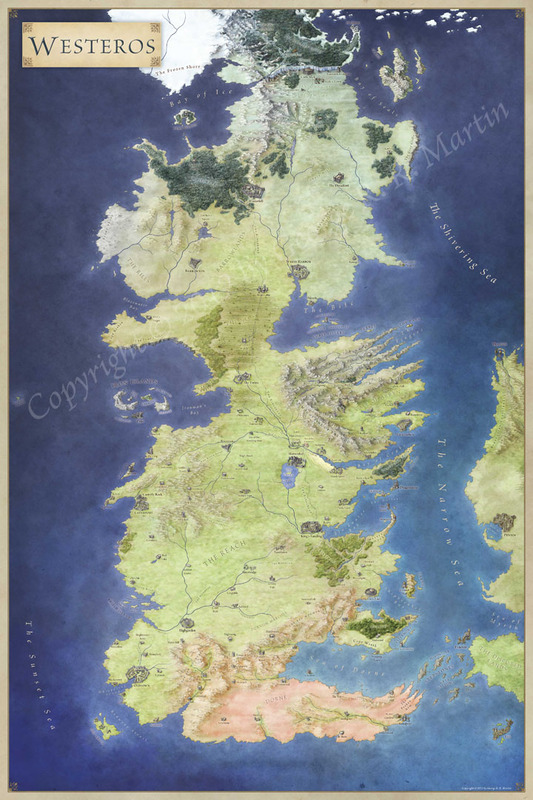 The texture will pull the whole map together and suggest more detail than you put in by hand. Then create a new layer with the colour blend mode underneath the lines. Take a very desaturated colour (I tend to use a brown that’s almost grey, maybe 5% saturation) and block in areas that should be stone. I use a grungy brush with low opacity and build up the greys slowly. You don’t want heavy round brush edges here. They may not show up at this stage, but you’ll notice hard edges on the colour layer towards the end. Finally, pick out the colours of non-grey objects, like wooden doors and water. Don’t worry about being too careful here. You’ll almost certainly go back and edit this layer before you’re done. I almost always use an overlay layer for light and shade. At this stage, you’re building up general form, so use a large brush – around the same size as a grid square. A fuzzy circular brush works well, or a grungy brush with low opacity. I like to make the floor the lightest area, as our eyes are drawn to the lightest point in an image. The walls and floors around the dungeon can be darker to suggest heavy earth and rock. I also like to darken the corner where the wall meets the floor. There’s no good reason for that physically, but is really seems to work for me when detailing maps. In this case I’ve actually built up two overlay layers to get to here – this is mostly because my background was so light. This is the stage that takes the time. Once again, add a new overlay layer. We’re going to start with the shadows because they are easier to add first and then add sharp detailed highlights after. Reduce the size of your grungy brush by half (at least) and start working in the darkest shadows. These should be along wall edges, and in nooks and crannies of natural stone walls. I also ran a dark brush along all of the flagstone lines to give a bit of dimension to the flagstones. Now switch to a light colour, and use a hard round brush with relatively small size and set the opacity to pressure sensitivity (if you’re using a tablet). Pick out sharp highlights. These should be along the any sharp edges, like the side of an outcropping, the edge of a flagstone, the edge of a door, the bright highlight on a door handle. I also added the stone effect in the surrounding earth by setting the hard brush to low opacity, adding a large scatter and allowing the size of the brush to vary. I threw in some scatter in the earth to hint at rocks and stones in the earth around the dungeon. Finally go back to your colour layer and make any tweaks you need now that the detailing’s finished and you’re done. 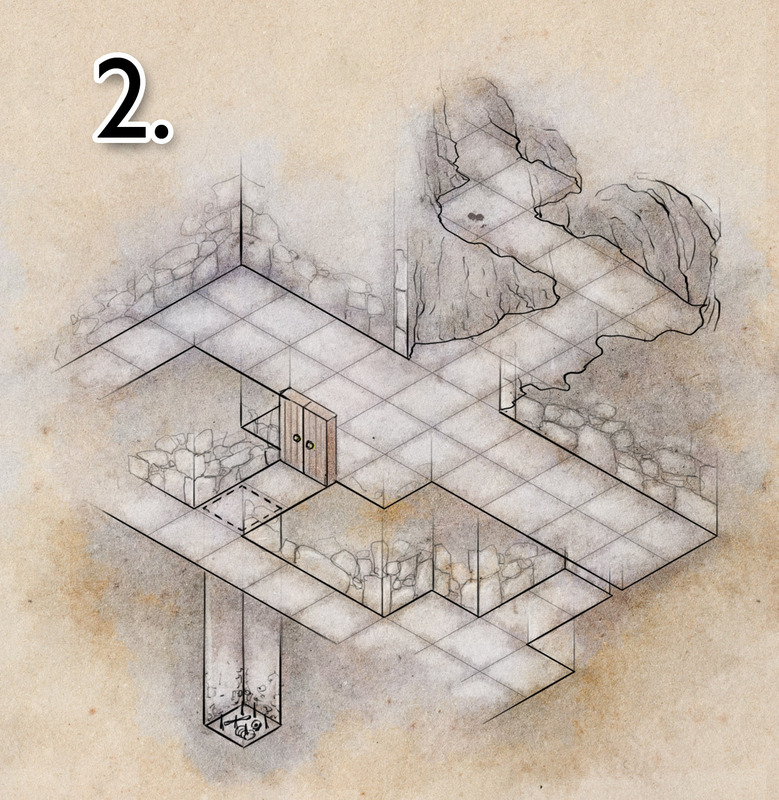 You can find the photoshop file for the iso dungeon here – feel free to play with the different layers and see what they do. I hope that’s handy, feel free to ask questions in the comments! 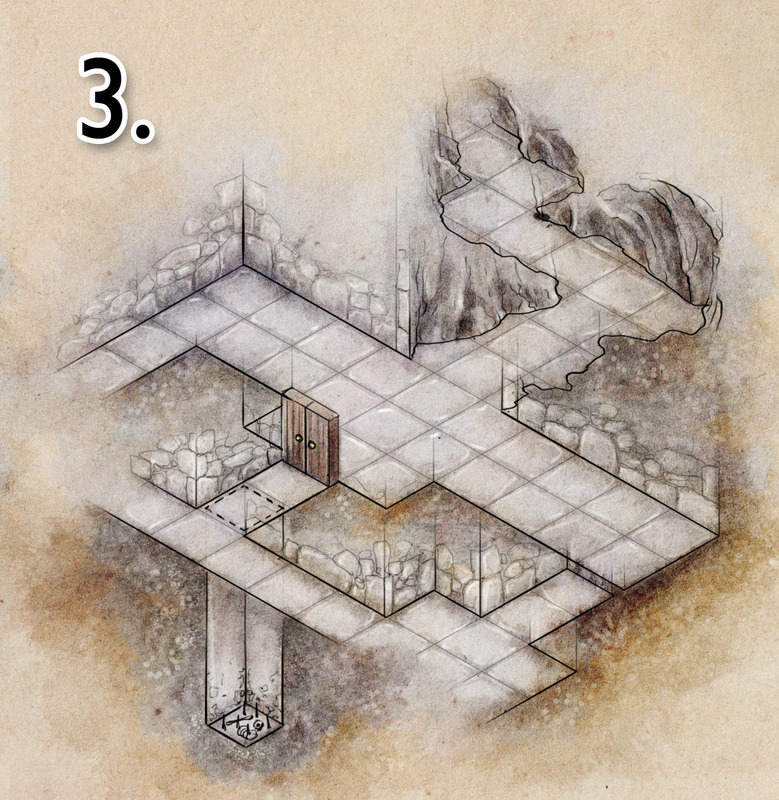 Do you sell any larger isometric maps which have a look similar to this one? 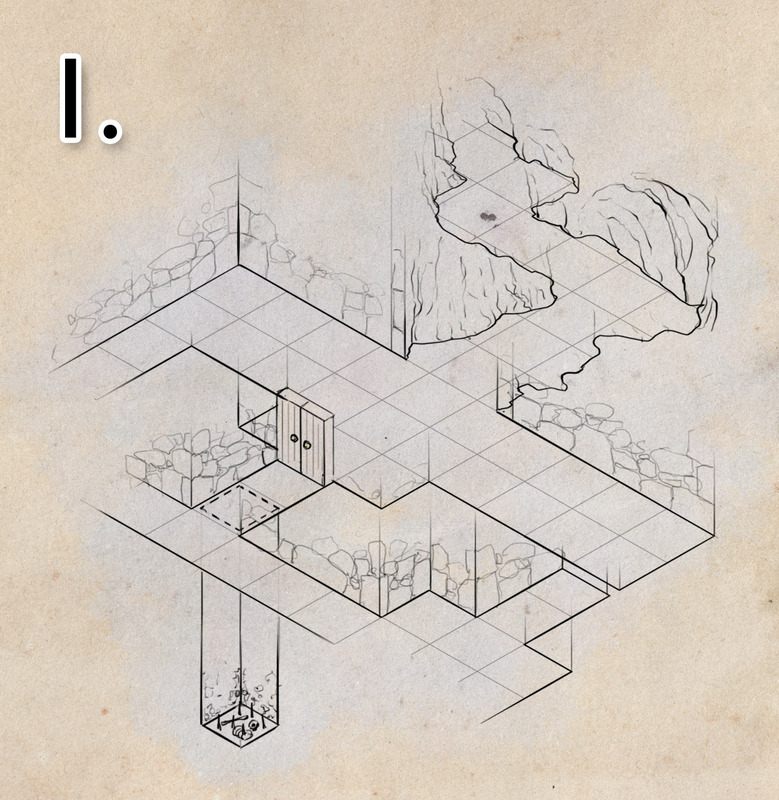 I’m pretty sure that has both the isometric and top down versions in the pack, but if there’s any problem send me an email at jonathan@fantasticmaps.com and I’ll sort it out. Awesome, Thanks! Love your work. Actually there is. It’s a light effect called ambient occlusion–you will notice it in photographs, as well as just by looking. It’s perhaps most obvious when you look at white walls meeting white ceiling, where there is only indirect lighting, or any acute angle between two white walls–there’s your darkened area where they meet! It’s one of the lighting passes used in photoreal 3D art as well. Good stuff here on your site! Thanks – that’s a good call!